Like any respectable .txt file geek on a Mac, I’m really into the apps nvALT and Marked. Since pretty much everything I type up these days is in Markdown format, there are many times throughout the day where I’m switching constantly between these apps to preview, and edit my documents. While, the robust features that Marked ($3.99) provides when rendering your content in HTML are really nice, nvALT’s built-in Quicklook-style previews are more convenient in that they only take one quick keystroke to pop up. But there’s a way to get the best of both worlds! After a few quick tweaks in the “Keyboard” System Preference Pane, I can now use ⌘E to seamlessly switch between from viewing a document in nvALT and Marked! I accomplish this in 3 steps. 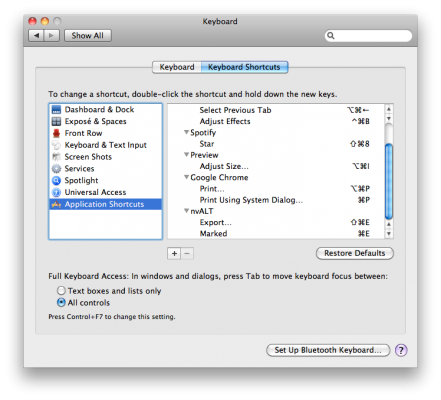 Open up your System Preferences to the Keyboard Prefs. Then Select the “Keyboard Shortcuts” Tab. Click the [+] again, but for this Menu Title have: “Marked” with the ⌘E shortcut.